… but it will take a while. 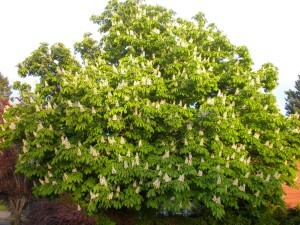 Back in 1900 there were billions of Chestnut trees in the US. Then, over 50 years, they died off, victims of a fungal blight. New trees would grow from the roots of the old, only to succumb themselves. But a few survived. And now it looks like scientists have managed to breed a resistant version. Next year 500 will be planted in Pennsylvania’s Westmoreland County. This entry was posted in Science and tagged ecology, genetics, trees by Chris Riley. Bookmark the permalink.